and we forget so much. Sun. Sep. 15, 1991: The beginning! We flew from Dallas/Fort Worth airport today on a United Airlines flight to Denver, Colorado. Several people came to see us off, and we said our last goodbyes for a while. We're spending about a week with relatives here before heading out. Still have a few things to take care of, like buying youth hostel maps and figuring out where we'll stay when we get to Hawaii next week, but overall we've got just about everything done. I still can't believe we got all our stuff into the packs. We've been just piling up everything we're taking in a corner for the last few weeks, and when it came time to actully pack it all up it looked impossible. Haven't quite figured out all the straps and adjustments on the packs yet, so they're feeling pretty awkward (and heavy!). Sun. Sep. 22: Waikiki, Hawaii. We flew to Hawaii last night on a QANTAS flight after stopping to change planes in Los Angeles. It was a pretty strange feeling stepping onto the plane, leaving home for an undetermined amount of time. We're thinking the money might hold out for about 10-12 months, but it's really hard to say since we've never been to any of the places we're going to--but I guess that's the point of it all. Arrived at 11pm, with no reservations, but found advertisements at the airport for a couple of hostels and called to get more info. Took a $6 shuttle bus to the hostel where we are now and got to sleep by 1am. This place used to be one-bedroom apartments. Four sets of bunk beds in the main room, and two more in a bedroom. Cost $15 each per night. A shock at first--it's in a good location, in the center of Waikiki, three blocks from the beach, but it's pretty run down, and it's more difficult than I thought it would be to stay in this place with so many strangers all sleeping in the same room. This a pretty big change from the lifestyle we've been living up until now. Today is the first real day, and so far it's pretty awful. I feel tired, and overwhelmed by everything. Things are not looking very good today. This is not the "grand life of a traveller" that I expected. Mon. Sep. 23: Waikiki. Got a normal night's sleep last night. I feel much better today. Things are starting to fall into place, and we're already starting to understand what this is all about. It was hard arriving so late at night, being shown to a dark room with so many people we didn't know already asleep in the bunk beds. But this morning we met a lot of those people, and discovered they're not so different from us. Most are backpacking for several months, and one girl from England has been travelling alone for a year and a half! People from the U.S. are a minority here at the hostel--lots of Europeans, Australians, and Canadians. I've never written in a journal before, and I'm not sure exactly how I'm supposed to do this. I also don't know exactly who I'm writing for, or who will read this. I guess the only people that will be interested in reading this will be my family and a few close friends -- and me, several years from now. I hope I can come back and read this and remember what it was like to be travelling. Waikiki reminds me of Japan--a lot of Japanese signs & restaurants, but also because it's very international--plastic food in the glass cases in front of the restaurants. Went to Pearl Harbor today and saw the USS Arizona--took the bus--long ride, but only 60 cents. Trying to stay within $30 per day, but it's difficult here. Walked along the beach last night--you can watch the shows at the back of the hotels just by sitting on the beach. It's very humid here, and warm even at night. Tue. Sep. 24: Waimea ("Wy-MAY-ah") Bay. Took a bus this morning to the North Shore hostel at Waimea Bay. 2 hour trip. Rooms here are separate units, 6 people per unit. Across the street from the beach--huge waves! It's very hot here all the time--no air conditioning in either hostel. Not quite the paradise I expected--I think Hawaii requires a lot of money to really enjoy it. Others tell me that the hostels in New Zealand and Australia are much better. Bought groceries tonight for the next few meals since we've got a kitchen with the room. Very isolated up here, but they have trips to go to movies, snorkeling, etc. Wed. Sep. 25: Waimea Bay. Hostelling seems to be a lot like camping--or maybe camping in a cabin in the middle of the woods. I've never liked camping--hope I get used to it soon. Sat. 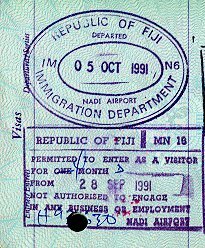 Sep. 28: Nadi, Fiji. Went on a hike Thursday (back in Hawaii) to "Sacred Falls"--2 miles each way through the foothills of some mountains on the north side. Took a lunch and ate at the waterfall--an 80 ft (24 meter) fall wedged between 2 steep cliffs. Really pretty area, and it was a nice break from the city. Took the bus to the airport Friday to fly to Fiji. Our flight was at 1:15 a.m. Friday morning. Hung around the bar at the Holiday Inn for a while to kill time. Lost the rest of Friday because we crossed the date line on the way to Fiji--it's 22 hours ahead of Hawaii here, so it's "ahead one day, minus two hours". Arrived here in Nadi (pronounced "Nandy") at 5:40 a.m. Found a free shuttle from the airport to the "Nadi Bay Motel"--very nice for the money. We got a private room with shared bathroom for F$35--comes to about US$13 per person. A nice change from the hostels in Hawaii. Nadi is a small town, like some I've been to in Mexico. Walked to the beach, but it was pretty disappointing--hard sand and brown water. Met a couple from Sweden on the way from the airport to the hotel--Per ("pear") and Ulrika ("ool-REE-ka")--very nice, ages 25 and 24--have already begun doing things with them, and we're planning to go with them to some other place on the south coast tomorrow. Looking for a nice beach for snorkeling. They're here for 7 weeks, then on to Australia and parts of S.E. Asia--they've already invited us to stay with them when we get to Sweden. I think this is a good hotel to get your bearings about Fiji, then move on to hopefully better cities and beaches. The four of us went to breakfast in the center of town this morning. We sat down at a table and looked over the menus. When the waiter came by to take our order, he asked, "Would you all like fried eggs and coffee?" One of us said something like, "I'll have scrambled eggs, toast, and tea with sugar." Someone else said, "I'll have a cheese omelette and coffee with cream and no sugar." And we all four ordered like that. The waiter just turned and walked away without saying anything or writing anything down. After about five or ten minutes, he came back and said, "Would you all like fried eggs and coffee?" We all said, "No, I ordered scrambled eggs... and I ordered an omelette... and I wanted tea instead of coffee." etc. Then the waiter disappeared again without saying anything. After another five or ten minutes (and we were getting pretty hungry at this point), the waiter came back and said, "Would you all like fried eggs and coffee?" All four of us said at the same time, "Yes please." Sun. Sep. 29: "The Hideaway", Fiji. Took a bus for an hour and a half with our new Swedish friends along the south coast to a resort called "The Hideaway". Found our blue water and snorkeling, but higher "resort" prices came with it. Staying in a dorm with 48 beds! Mostly young students (elementary ages). Food is expensive here! The food in Nadi was very cheap--so our goal is to find a nice beach with a cheap room, which isn't so isolated. This place is US$12, but there's only one (very expensive) restaurant, and no stores nearby. Per and Ulrika are on a 6-month trip around the world. They're leaving for Sydney, Australia Nov. 18th, then working their way north to Cairns, then back down to Sydney to fly out Dec. 26th for Bangkok, then by land to Singapore, and finally back home on February 18th. It's been really nice traveling with them--they're a lot like us, and are just starting their trip also. Went walking along the beach today, and we're planning on doing some snorkeling there during high tide tomorrow morning. Probably will stay here another night, then move east some more. This whole hostelling thing is getting easier--mostly I think because we're out of Hawaii--it was so expensive, and the hostels were so run-down there.